A meatless Monday favorite in our house are these inexpensive lentil pies. They’re full of flavor and a finger food! Full disclosure, these aren’t actually pies. Skill level- Beginner. Involves chopping, baking, mixing and mashing. 5 ingredients and 5 common spices. 4-6 small shiitake mushrooms (please try this, even if you don’t like mushrooms, they aren’t soggy and they really add to the burger flavor. Step 1: Start the polenta by putting 2 cups of cold water into a large frying pan. Add 1/2 cup of corn meal and stir until it’s mixed into the water well. Leave on medium heat, occasionally stirring until it begins to boil then turn down the heat to low. Let the polenta slowly cook on low heat for 15-20 minutes then turn off heat and let cool. Step 1: Rinse canned lentils in strainer and place them in a large mixing bowl. Step 3: Mash the canned lentils in a medium sized bowl with a potato masher. Mix in chopped zucchini and mushrooms. Step 4: Add spices and mix well. Taste the lentil mixture to assess flavors, before you add more spices don’t forget that as the lentils cook flavors will become more prominent. If you like spicy foods try adding extra spices. 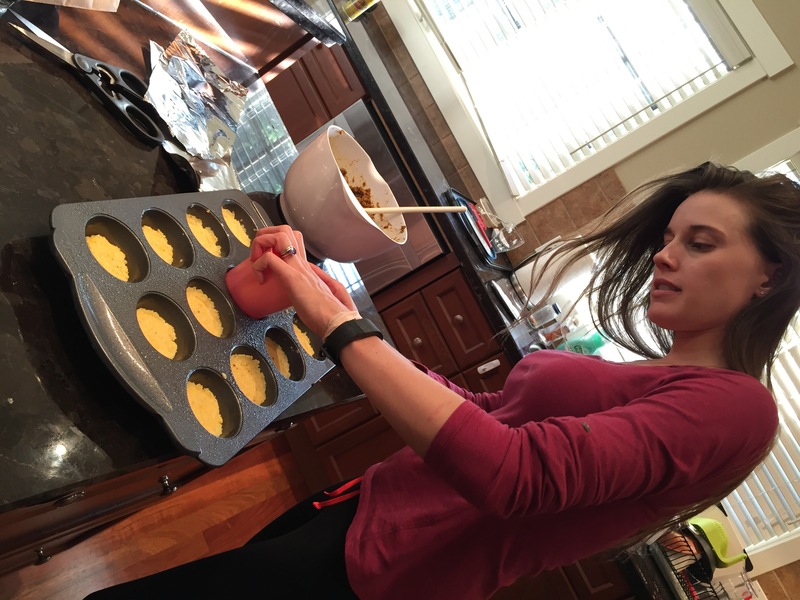 Step 5: Fill the bottom of a muffin tin with polenta (fill about 30%). 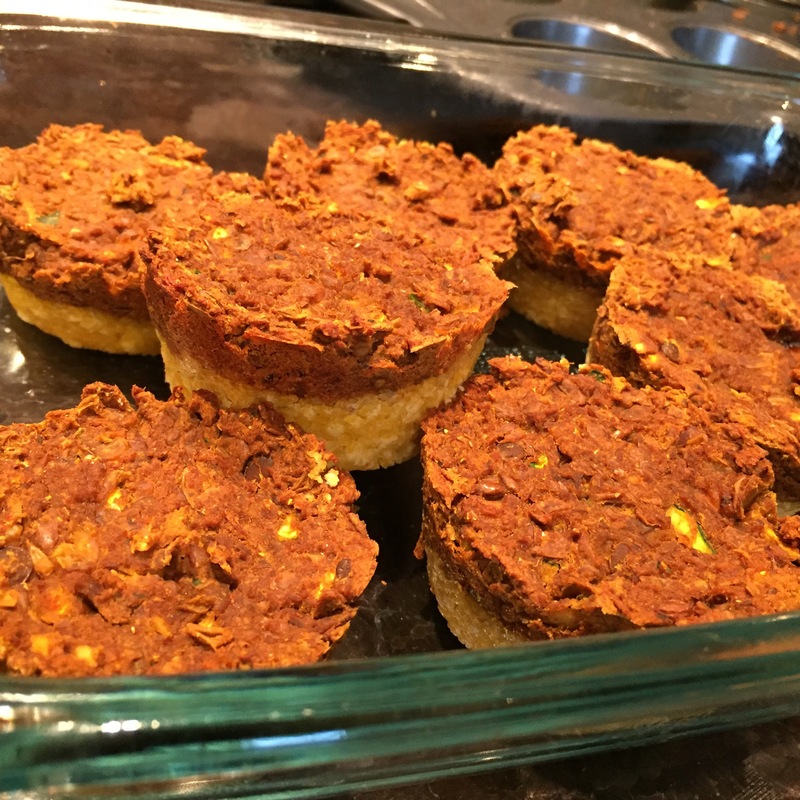 Use a cup to squish down the polenta into the muffin tray and top with curried lentil mixture. Step 6: Bake at 375 for approx 20 minutes until beans are firm and beginning to form a crust. Step 7: Let cool for 5 minutes then remove from muffin tray and eat. They pack well for lunches and meals on the go. Serve with your favorite vegetable. 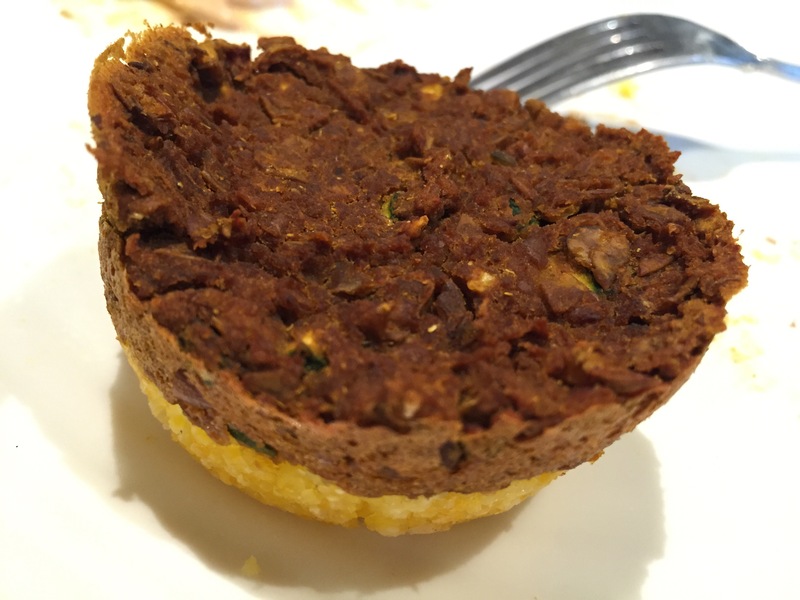 Skip the polenta step and make lentil burgers! Add an egg and 1 tbsp oats or oat bran after step 4. Mix well. 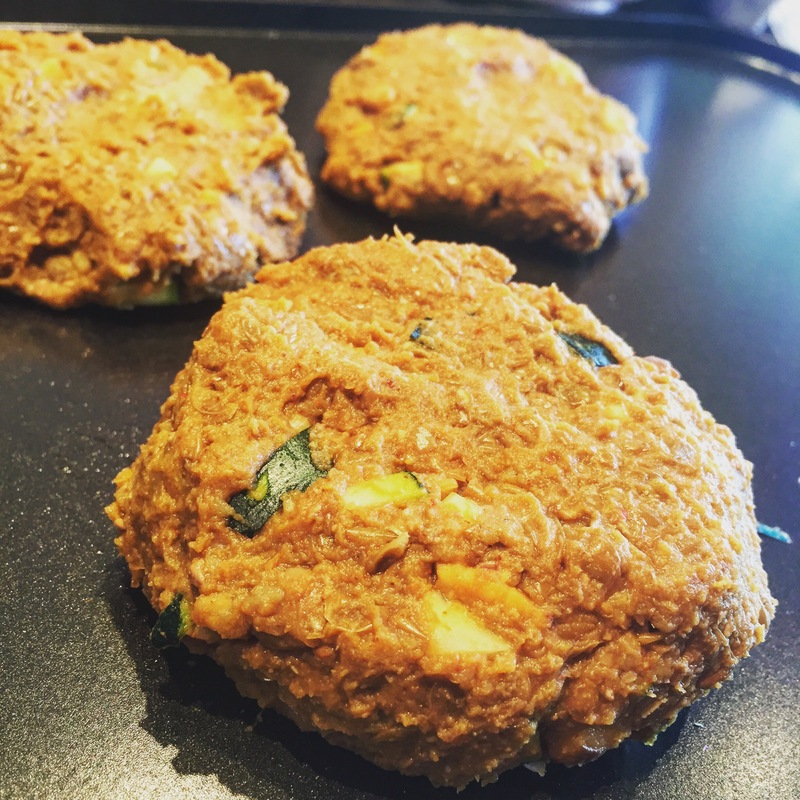 Form the lentil mixture into patties and cook well. Cook on BBQ, in a frying pan, on a griddle, in a panini press etc. Try serving a cooked lentil burger in a bun with your favorite burger toppings and a side salad. 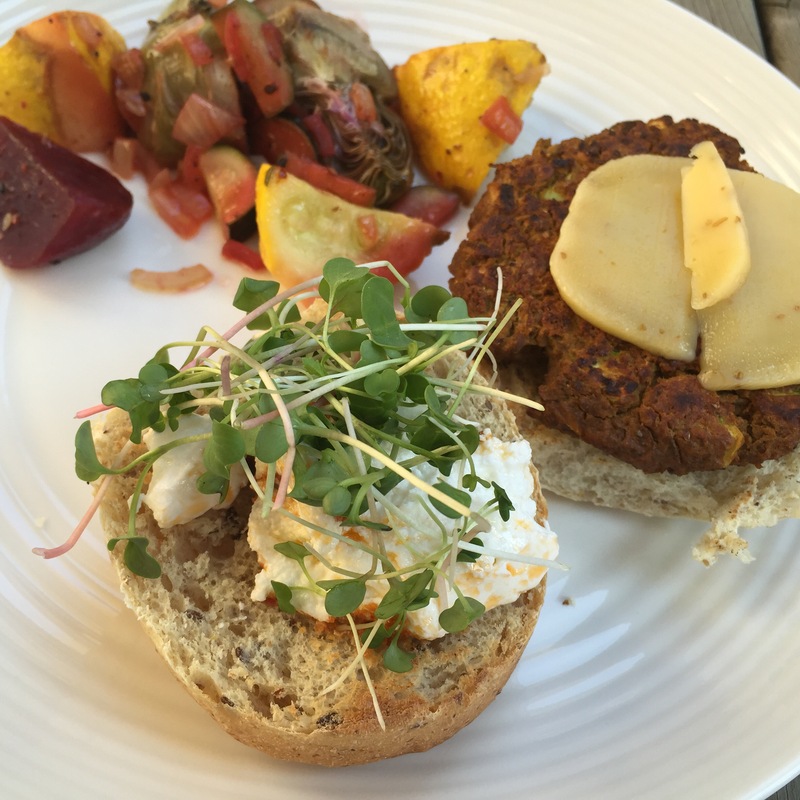 I love lentil burgers with microgreens, labneh or tzatziki, cheese and hot peppers.